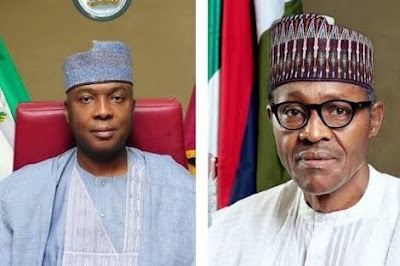 Buhari's Man Describes Saraki-led Senate As "Worst"
Prof Itse Sagay, who is the Chairman of the Presidential Advisory Committee Against Corruption (PACAC) and Falana, an activist, wondered what the senate was out to achieve by chasing the shadow. The SAN said he could not wait for the Eighth Senate, which he described as the worst since 1999, to go next year. He said it smacks of personal vendetta for the lawmakers to reject the IGP’s representatives. Sagay said he was not a fan of the current Senate, which he accused of abdicating its responsibilities by not passing the 2018 budget almost halfway into the year. According to him, the Senate lacks the moral justification to declare the IGP as unfit to hold public office. His words: “You know I’ve never been impressed by this Senate. It’s probably the worst we’ve ever had since the return to civilian rule. They are more concerned about exercising vain authority and power than in actually doing anything substantive for the country. “These are people – the whole Senate – who would adjourn sitting and go to the Code of Conduct Tribunal in solidarity with their President. For everyday they go, the work of legislation is suspended. And they owe a duty to this country to make the laws for the order, peace and good government of Nigeria. “Each time they abandon their legislative duties, they’re in fact committing a breach of their obligation, apart from the fact that doing that sort of thing is infantile. “As if that was not enough, the whole Senate packed themselves again to visit Dino Melaye in the hospital. How rational is that? Why can’t they send a delegation of two or three people who would report back? Asked if the IGP should not have responded to the Senate’s invitations, Sagay said: “What I can deduce from the Police response is that the IGP has been honouring the Senate’s invitations. “You know the frequency and flippancy with which this Senate invites people. They can invite you today and next week they invite you again. And these (those invited) are very busy people. “They (Senate) don’t care. They just want their vanity to be assuaged, for people to know they have power and are big and that someone is disobeying their authority. “The IGP sent a very highly-placed representative. If the Senate really wanted information, why didn’t they get it from IGP’s deputy rather than insisting that the IGP himself must come? It suggests they’re turning the whole thing into some form of personal vendetta. “As I said, I’m not impressed with this Senate because as we’re speaking now, we’re going to half of this year and they have refused to pass the budget. “Is that a Senate that should be calling anybody unfit for anything? Are they doing their job? Budget passing is the most important job of the legislature. They’ve not done it six months into the year.